When you have a country site of 6 acres, it is important to plan it properly to not only fit everything you needed and was convenient. It is clear that much of the land is a house and its location, rather, must be consistent with the model plan. But outbuildings, garden, vegetable garden and flower garden can be placed according to your taste. Draw a site plan on graph paper or in one of the programs is addressed to architects, for example, AutoCAD. Label the house and outbuildings. Depending on your needs, you will need a barn, summer kitchen and bath. To save space, all three modules can form a single structure, which is place at some distance from the house to the smell of the food or heated baths did not go straight to the room. Also provide toilet and a well. Most often they are on the inside lane. First – as close to the neighbor's house of similar sense, which is reasonable for small areas. Second - and at very often in combination. 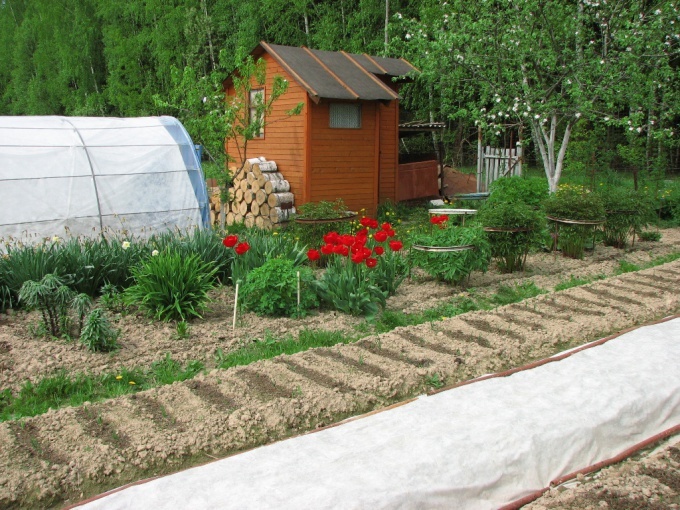 Plan a vegetable garden. It is desirable that it was adjacent to the summer kitchen – so it will be convenient to dispose of the crop. The size of the area which would be taken under the beds depends on the size of your family, and are making preparations for the winter. Usually, summer for on-site consumption enough vegetables with 1-2 acres. But if you do "plantation" of strawberries or potatoes – place for them should also be considered. Planted garden trees next to the toilet and outbuildings. So you will be able to somewhat enclose them. For the family it is appropriate to plant 3 Apple trees (summer, autumn and late autumn maturing), 1 pear, 2 cherry and plum. Planting trees, divide: pome and stone will not give high yields if you grow together. The delimiter may be, for example, bushes of black and red currants. On the site good to have 4 Bush - 2 first and Bush the second. Also worth as a "shield" to use raspberry. Break the flower garden. Next to the buildings it is better to plant perennials. Alternatively, under Windows complete Alpine slide or the ridges are a variety of beds, differing in shape and relief. Among all areas, route paths. Create paving slabs that will give your site a more well-groomed appearance.